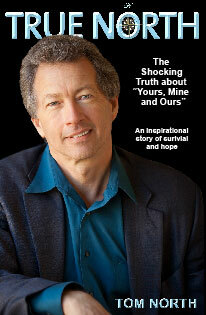 a story about domestic violence and child abuse and his journey of survival and hope. After years of struggling with the decision about whether or not to tell his true story of growing up in the family made famous by a hit movie, award-winning author, Tom North, gathered the courage to write his book, True North – The Shocking Truth about “Yours, Mine and Ours”. 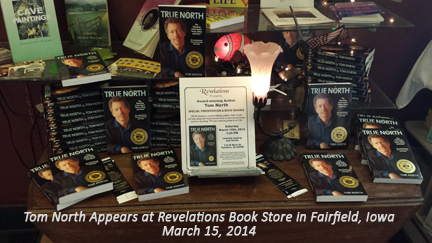 North will make a special appearance at Revelations Book Store, 112 N. Main Street, Fairfield, Iowa, on Saturday, March 15, 2014, at 1:30 PM for a presentation and book signing. Hundreds of scientific studies have been conducted on the benefits of the Transcendental Meditation program at more than 200 independent universities and research institutions worldwide over the past 40 years. TM is an evidence-based, alternative therapy shown to heal and empower victims of abuse. True North – The Shocking Truth about “Yours, Mine and Ours” has won a Living Now Award Gold Medal, is Recommended Reading by the Washington Times, has garnered rave reviews by Writer’s Digest and Independent Publisher Magazine, and is an Amazon Best Seller. Tom North appears on radio and television programs, and is a keynote speaker at colleges, universities and conferences. He is an Official Supporter of National CASA for Children.